Going west was always a driving force for many families looking for a better life. 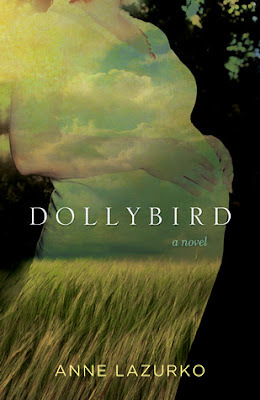 But in Dollybird, our main character Moira didn't really choose to go west -- she was banished from her Newfoundland home in 1906, sent off to an uncle in Saskatchewan, when it was discovered that she was pregnant. The other party in this pregnancy gets off scot free, of course: quite literally, as he is sent to medical school in Edinburgh. Poor Moira, on the other hand, must fend for herself in the wild new frontier of the Saskatchewan prairie. When it turns out her uncle doesn't want her around after all, she takes on the dubious position of "dollybird" to a widowed settler with a son. He needs a housekeeper and childminder, and she needs a home. At this time, the phrase "dollybird" could mean such a housekeeping position, but it could also have shades of "mistress" to it. Nevertheless, she takes on this challenge to make a home for herself and for her soon-to-arrive child. Thankfully, Lazurko doesn't fall back on the easy, romance novel solution of having Moira & her employer fall in love. They are both about the same age, but they become friends only after a prickly start. They both receive emotional support from other, new friends. And there are a variety of such -- from other settlers nearby, to the "fallen women" that Moira gets to know after she is summarily fired from her first housekeeping job in town. Moira's character is strong and resilient, and her resistance to being caricatured as an unwed mother in this society is admirable. She negotiates relationships with her distant family as well as with the small society she has landed in, and finds a respectable place for herself, refusing to give in to censure. The landscape itself is also a character -- the storms that pass over are stunningly told, especially one near the end of the book. Nature is very powerful, and has an enormous effect on whether or not these new inhabitants of this vast landscape will succeed or fail, and Lazurko shows that clearly. This was an historical novel lightened by the fresh scent of modernity, which also has cross-Canada appeal. If you like prairie stories with a strong female lead, this will be a good choice for you! I haven't read The Magic of Ordinary Days -- but I've always thought that was a fabulous title, so reflective. But I am glad I could share this one with you! It's hard for small press books to get the word out, even though there are so many good ones. This sounds like a book I'd enjoy reading. I'd never heard of the term dollybird before. I'd never heard it either, actually. This book gave me some new info on my very own home province!